Outline Shift is an idea that adds extra options to the Outline FX panel. I came up with this idea while using Publisher Beta but I'm posting it here because it relates to the FX panel which of course is Designer at its core. While using Publisher to create documentation, I thought to myself, I want to use the FX panel to create a picture frame around images in my documentation and save it as a style that I can easily apply to graphics without having to create and manage additional layers with every picture I import. I realized that a great way to make this possible is to provide the current Outline FX panel redundant abilities with a few new controls. I'll explain what the controls can do before discussing how they could work in practice. 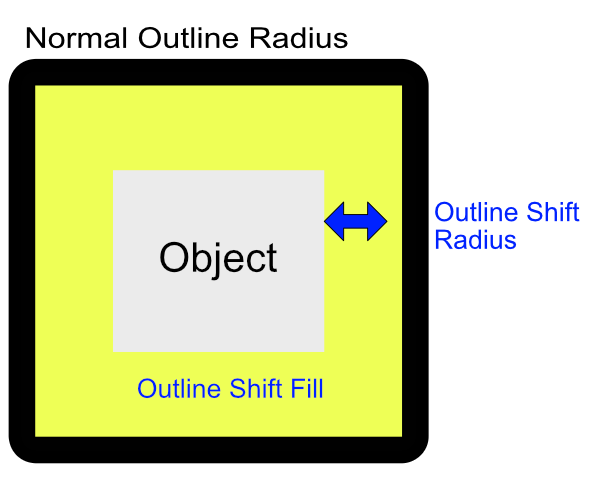 The Outline Shift would be a slider control below the current Radius slider which basically pushes the outline outward from its default position. Similar to anchoring a shape to center and increasing its size proportionately. With this option I can create a Frame around any object. Step 1 complete. The next option "Outline Shift Fill" basically adds a color background or swatch of any kind and is contained within the normal outline. Check out the attachment illustration of how it works. As you can see, you can effectively create a frame with a background color. What is amazing to me is that the additional controls do exactly what the outline already does but as a redundant layer. Essentially you could have the normal outline radius as 0, and have a Shift Value with color to providing the same look, however now that you do have the extra border from the normal outline, more is possible. The last point I make is that these options could be useful because there is no such thing as "Color Underlay" or "Gradient Underlay" FX styles which could be handy if they existed on their own. However the idea presented here not only consolidates these options but makes them more powerful because being able to create a frame around an object is very practical in of itself.